Check out the Free software from BPAA that helps you create your own professional Digital Menu Boards. *Be sure to utilize our Smart Buy partner Best Buy for Business to receive discounted TV and Wall Mount Pricing. We have found that Insignia, Samsung, Vizio and Sharp TVs work the best for the menu board software. The new, easy-to-use tool that enables you to create and print your own professional Combo Meal Displays. Packaged with a variety of templates and styles fashioned by professional designers. Customizable content and graphical elements. Gives user the ability to directly print their custom document. Only available to BPAA centers pouring Pepsi under the National Agreement. Core 4 Fountain unit for our smaller centers. Centers that have not been able to support regular fountain equipment in the past can now take advantage of the opportunity to get NEW fountain equipment to fit their needs and also take advantage of the BPAA National Pepsi program. 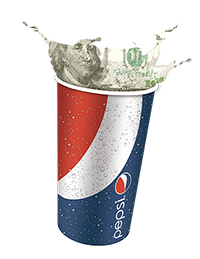 The Core 4 unit will provide centers with the Core 4 brands of Pepsi *(Pepsi, Diet Pepsi, Mountain Dew and Sierra Mist) while providing National Pricing and a per gallon rebate. Available in 3 gallon BIBs when mixed water reconstitutes to 2,534 finished ounces. The dispensing equipment is available in a one or two 50 gallon barrel unit, with an easy auto fill automated replenishment system. The unit will pour 20 to 30 16 oz. servings per hour. Each unit will come with a vibrant and impactful merchandising kit. You will also receive a dispenser that holds 2 cup and lid sizes. *Only available through participating Pepsi bottlers. For Pepsi, Sierra Mist, Mountain Dew, & Fizze Mixology Recipes see link below.